Whether you are planting in your garden or relaxing at a friend’s barbeque this weekend, here are some easy recipes to prepare on the fly. Both include a refreshing fruit that everyone loves and associates with summertime fun – watermelon. Toss together, chill and serve. Wash and slice the strawberries and add sugar, place in fridge for ½ hour. This draws out the juices. Thinly slice the Asian pear and cube the watermelon. Toss into the strawberries. Wash and drain the lettuce and arugula and place in large bowl. Spread the fruit mix around the outside of the bowl. Shave the asiago cheese and place in the center of the bowl. Sprinkle hot crushed pepper. Serve the salad dressing on the side. It should not be tossed into the salad prior – toss when serving and go lightly so as to experience all the flavors. P.S. As promised on yesterday’s fan page, http://www.facebook.com/pages/Bilowz-Associates-Inc-Our-Blog-Annies-Gardening-Corner/325316334444 there will be a fun Memorial Day Contest. Two free passes for Tower Hill Botanical Garden in Boylston, MA to the 125th Facebook Fan. You have to join our Facebook page and become a Fan! 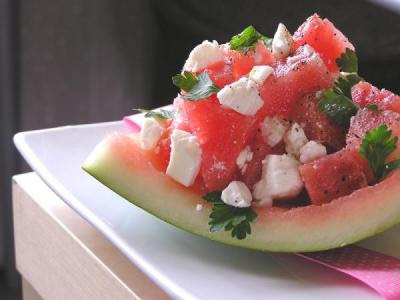 Image of Watermelon Salad from the Internet. This recipe looks like it used parsley but a very cool way to serve it!